For sure, we all know the figure of Antoni Gaudí, Catalan architect who designed some of the most incredible buildings of Barcelona. He is the most representative architect of Modernistic style, and his works completely broke the style of his epoch and presented a new way to understand not only architecture, but also art and culture. Gaudí style was totally influenced by nature. He observed, analyzed and studied nature to understand how the world is built and use those patterns to design his buildings. This is perfectly understandable when we read again one of his most famous statements: “originality consists in returning to the origin”. So, if you are visiting the Catalan capital, don’t hesitate to follow the steps not only of Gaudí, but also other geniuses such as Dalí and Picasso in Barcelona. In this case, we talk about mysteries and secret wonders of Gaudí you may not know about. Sagrada Familia Temple… What a surprise! What a mystery! Keep calm, we are not here to exalt the beauty of this great masterpiece because it is known all around the globe and it is beyond any doubt. Otherwise, we are talking about some curious data about this Modernistic giant. There is not a single straight line in the interior of Sagrada Familia. Not one! As we said, Gaudí took nature as inspiration when designing his works, and straight lines are not a characteristic of nature. Also, columns were designed as trees forming all together a great forest. It is an incredible experience to look up from the center of the basilica and feel we are part of a huge forest made of stone and granite. Another interesting fact about Sagrada Familia is that Gaudí knew he would not be able to live long enough to see his work finished. That is why he wrote some guidelines about the basilica construction. However, he wanted the next architects to work freely. In fact, he wanted each part of the building to be individually built in order to represent the different architectonical styles of the successive generations. 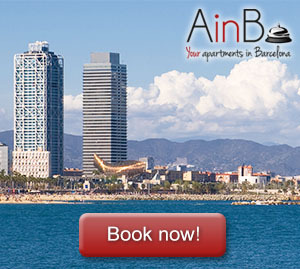 Don’t miss the opportunity of enjoying Sagrada Familia at first hand from your apartment in Eixample neighbourhood. Gaudí’s works connect in a special and positive way with Japanese society. The reason of that is that Japanese culture is deeply related to nature and the search for essence and origin. Furthermore, Zen Buddhism has also strong similarities with Gaudí’s thoughts and sources of inspiration. When we walk through The Ramblas, maybe the most famous street in Barcelona, we find Plaça Reial, wich is the most beautiful square in all Barcelona. A precious fountain in the middle of the square surrounded by an army formed by palms and two magnificent lampposts. Can you guess who designed these lampposts? Right! A young 27-years-old Antoni Gaudí. This square is a compulsory stop while visiting Barcelona. Not only is a precious place to discover, but also a place where we can eat or have a drink. Indeed, there are plenty of restaurants with terraces and clubs with all kind of music such as Jamboree: a well-known jazz-club. Calvet house is a modernistic building designed by Antoni Gaudí located in Eixample neighbourhood of Barcelona. It is not just an incredible construction with the recognizable print of Gaudí (abundance of curves, impossible shapes, nature-inspired…), but also a restaurant of contemporary Mediterranean cooking where we can enjoy a special meal. One does not have dinner in a building designed by Gaudí every day!